Blurb Description: A new spin on the classic smart-girl-and-bad-boy setup, this witty contemporary romance shows how easily a friendship – even one built on an elaborate lie – can become so much more. Jenny meets Chance for the very first time when she is assigned as his partner in their Junior Oral Communications class. But after they rescue a doomed assignment with one clever lie, the whole school is suddenly convinced that Little-Miss-Really-Likes-Having-A’s and the most scandalous heartbreaker in school have been best friends forever. It’s amazing how quickly a lie can grow―especially when you really, really want it to be the truth. With Jenny, Chance can live the normal life he’s always kind of wanted. And with Chance, Jenny can have the exciting teen experiences that TV shows and movies have always promised. Through it all, they hold on to the fact that they are “just friends.” But that might be the biggest lie of all. 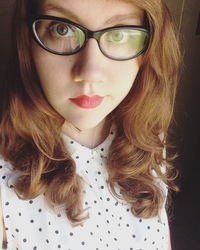 Debut author Tiffany Pitcock delivers a spot-on depiction of first love and the high school rumor mill in Just Friends, chosen by readers like you for Macmillan's young adult imprint Swoon Reads. If you don’t already know, Best Friend romances are one of my FAVOURITE Young Adult tropes out there. Or one of my favourite movie/ book/ TV show tropes period. 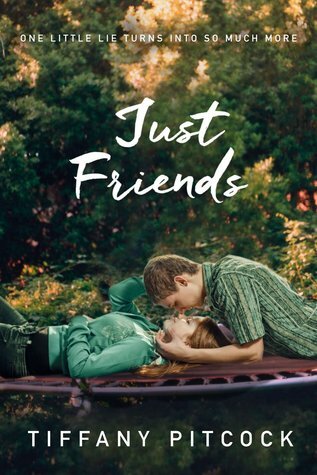 And so, when I saw the gorgeous cover for Tiffany Pitcock’s debut novel and the title that alluded to this book containing my favourite trope, I KNEW that Just Friends was a book I would definitely read. Then, the lovely humans at Macmillan International approved my request and I was absolutely over the moon. 1. In a nutshell, this book took a little while to get used to. It’s told in Third Person and it switched between the boy (Chance) and the girl (Jenny) and it seems very CHILDISH. Third person doesn’t usually strike me as odd, but something about “Jenny just couldn’t stand it,” and “Chance always screwed everything up,” made the writing slightly strange. 2. After a quarter of the book, I stopped noticing the third person dialogue that much and begin enjoying the book. Jenny and Chance had this way of getting along with one another like they truly had been friends since they were little and I did like most of the dialogue between them. 3. Something that annoyed me slightly was the LACK OF ANYTHING PARENTAL. And I mean ANYTHING. Chance’s parents were ALWAYS fighting even though we don’t see them once and don’t hear even a SINGLE ARGUMENT. And Jenny’s mom who was supposed to be around wasn’t ever since she started dating and Jenny and Chance were ALONE ALL THE TIME? I’ve never believed how parents conveniently disappear for the plot to advance because THAT DOESN’T HAPPEN IN REAL LIFE. 4. Jenny was a CRAP best friend to her “only friend before Chance” in the book – Kesley. They’d been friends since middle school, but Jenny was this self-absorbed little wretch that she dropped her friend AS SOON AS Chance paid the slightest bit of attention to her. I felt even worse when we actually HEAR from Kesley about how she thought she was a “big joke” to Jenny and well, BEING HORRIBLE TO YOUR BEST FRIEND IS NOT COOL. 5. I pretty much feel like this book had quite a good underlying story, but it was so focused on the ROMANCE it forgot the other EQUALLY important parts like Friendship and Family. I liked the book but not THAT much. It was a good debut which could have been better. 3 stars. #RespectYourFriends. What are some of your Favourite YA Tropes, and which are the ones you hate? Are you still in touch with your best friends from High School? Were the friends you made in school better, or the ones in college? Have you had a chance to read Just Friends? What did you think of it? I can't wait to hear from all of you lovelies!